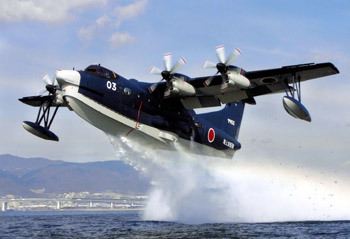 The Indian Navy is progressing its effort to acquire 12 Japanese-built Shimaywa US-2i amphibious aircraft. The $1.65 billion deal for a dozen specialised jets is being progressed as part of the Services Capital Acquisition Plan (SCAP) for 2015 at the MoD. Indian and Japanese teams, part of a working group set up with former Prime Minister Manmohan Singh visited Japan in May 2013, are currently working out the modalities of what will be Japan's first defence export to India, a milestone event for a country that constitutionally bars the export of military technology. The visit of PM Modi to Japan last year has stepped up momentum on the deal, with the possibility of at least a draft final agreement this year. The Indian Navy needs the aircraft for a variety of missions, including surveillance around its island territories, specifically the Andaman & Nicobar Islands where the first fleet of aircraft are likely to be based. It is also understood that the Indian Navy's full requirement will be a larger number, which will be communicated once the first deal is finalised and all financial, technology and assembly details are fully worked out. Officially, the Navy requires the aircraft for search and rescue missions, inter-island communication, rapid response duties and reconnaissance of islands, but also as an offset to China's growing strength at the north end of the Andaman islands.